Cosmonauts Oleg Kononenko and Anton Shkaplerov spent six hours and 15 minutes working outside the International Space Station Thursday, moving a telescoping crane from one Russian module to another. But the work proved more difficult than expected and the spacewalkers did not have time to install debris shields on the Zvezda command module as originally planned. They did, however, manage to install a materials science space exposure experiment on the hull of the station and to collect one of two surface residue samples from the lab's exterior as part of a long-range engineering study. Installation of support struts for a Russian spacewalk ladder was deferred. After depressurizing the Pirs compartment, the cosmonauts opened a hatch to the vacuum of space at 9:31 a.m. EST (GMT-5). They struggled briefly to secure a protective ring around the hatch opening and floated outside about 15 minutes later. This was the third spacewalk for Kononenko, who logged 12 hours and 12 minutes of EVA time during an earlier stay aboard the station, and the first for Shkaplerov. "I can’t wait," Shkaplerov said before launch. "I have heard a lot on the effects of the first EVA on a crew member. You step into an abyss, there is nothing underneath it, you cannot see the Earth and you’re walking on the dark side of the station. Then you have to operate your EVA suits. It’s a very difficult task, but it’s very challenging and interesting." As usual during station spacewalks, the lab's four other crew members were stationed near their respective Soyuz spacecraft as a safety precaution in case of a major problem that could force them to make an emergency departure. Expedition 30 commander Daniel Burbank and Anatoly Ivanishin were sealed inside the Poisk module, where Soyuz TMA-22 is docked, for the duration of the spacewalk. Donald Pettit and European Space Agency astronaut Andre Kuipers were isolated in the forward part of the station where they could access their Soyuz TMA-03M spacecraft docked to the Rassvet mini research module. 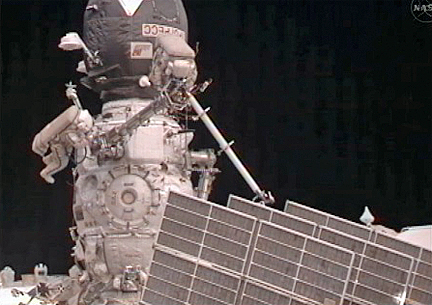 The first item on the agenda for Kononenko and Shkaplerov was to move one of two telescoping Strela cargo booms from the Pirs module on the Earth-facing side of the station to the Poisk module attached to the other side of the Zvezda command module. The manually operated cranes are used by spacewalkers to move equipment to different work sites on the Russian segment of the station. The cosmonauts ran into problems right off the bat, struggling to disassemble and move the boom components in the weightlessness of space. The task was finally completed about 1:15 p.m. At that point, the spacewalkers were more than an hour and a half behind schedule. A second Strela boom, also mounted on Pirs will be moved to the Russian Zarya module during the next planned spacewalk in August. The cranes are being relocated because the Russians plan to discard Pirs next May to make room for attachment of a larger multi-purpose laboratory module. The cosmonauts had hoped to install five micrometeoroid shields around the forward end of the Zvezda module, but they ran out of time wrestling with the Strela move. The work was deferred to a future spacewalk. After re-stowing the Strela 2 boom still attached to Pirs, Kononenko and Shkaplerov spent a few minutes collecting a surface residue sample from Zvezda's hull. "For that we have a special kit, we have cotton swabs, and we'll try and sample those substances and send those down to the ground," Shkaplerov said before launch. "That's how we'll know what settles on the structure of the station outside and that will help us determine how long the station can be in operation. The age of the ISS is already 11 years plus, and we'll find out whether the station can survive and stay safe until 2020 and beyond." The cosmonauts floated back inside and closed the hatch at 3:46 p.m. to officially end the excursion. Spacewalk duration was six hours and 15 minutes, pushing total space station EVA assembly time to 1,021 hours and 47 minutes over 162 spacewalks. Two more spacewalks are planned for later this year, another Russian excursion in August followed by a NASA EVA.